A Sermon Preached in the Chapel of Princeton Theological Seminary, on Sunday morning, March 10, 1929. By Rev. Professor J. Gresham Machen, D.D., Litt.D. The Apostle Paul was a great fighter. His fighting was partly against external enemies — against hardships of all kinds. Five times he was scourged by the Jews, three times by the Romans; he suffered shipwreck four times; and was in perils of waters, in perils of robbers, in perils by his own countrymen, in perils by the heathen, in perils in the city, in perils in the wilderness, in perils in the sea, in perils among false brethren. And finally he came to the logical end of such a life, by the headsman’s axe. It was hardly a peaceful life, but was rather a life of wild adventure. Lindbergh, I suppose, got a thrill when he hopped off to Paris, and people are in search of thrills today; but if you wanted a really unbroken succession of thrills, I think you could hardly do better than try knocking around the Roman Empire of the first century with the Apostle Paul, engaged in the unpopular business of turning the world upside down. But these physical hardships were not the chief battle in which Paul was engaged. Far more trying was the battle that he fought against the enemies in his own camp. Everywhere his rear was threatened by an all-engulfing paganism or by a perverted Judaism that has missed the real purpose of the Old Testament law. Read the Epistles with care, and you see Paul always in conflict. At one time he fights paganism in life, the notion that all kinds of conduct are lawful to the Christian man, a philosophy that makes Christian liberty a mere aid to pagan licence. At another time, he fights paganism in thought, the sublimation of the Christian doctrine of the resurrection of the body into the pagan doctrine of the immortality of the soul. At still another time, he fights the effort of human pride to substitute man’s merit as the means of salvation for divine grace; he fights the subtle propaganda of the Judaizers with its misleading appeal to the Word of God. Everywhere we see the great apostle in conflict for the preservation of the church. It is as though a mighty flood were seeking to engulf the church’s life; dam the break at one point in the levée, and another break appears somewhere else. Everywhere paganism was seeping through; not for one moment did Paul have peace; always he was called upon to fight. Fortunately, he was a true fighter; and by God’s grace he not only fought, but he won. At first sight indeed he might have seemed to have lost. The lofty doctrine of divine grace, the centre and core of the gospel that Paul preached, did not always dominate the mind and heart of the subsequent church. The Christianity of the Apostolic Fathers, of the Apologists, of Irenæus, is very different from the Christianity of Paul. The church meant to be faithful to the apostle; but the pure doctrine of the Cross runs counter to the natural man, and not always, even in the church, was it fully understood. Read the Epistle to the Romans first, and then read Irenæus, and you are conscious of a mighty decline. No longer does the gospel stand out sharp and clear; there is a large admixture of human error; and it might seem as though Christian freedom, after all, were to be entangled in the meshes of a new law. But even Irenæus is very different from the Judaizers; something had been gained even in his day: and God had greater things than Irenæus in store for the church. The Epistles which Paul struck forth in conflict with the opponents in his own day remained in the New Testament as a personal source of life for the people of God. Augustine on the basis of the Epistles, set forth the Pauline doctrine of sin and grace; and then, after centuries of compromise with the natural man, the Reformation rediscovered the great liberating Pauline doctrine of justification by faith. So it has always been with Paul. Just when he seems to be defeated, his greatest triumphs, by God’s grace, are in store. The human instruments, however, which God uses in great triumphs of faith are no pacifists, but great fighters like Paul himself. Little affinity for the great apostle has the whole tribe of considerers of consequences, the whole tribe of the compromisers ancient and modern. The real companions of Paul are the great heroes of the faith. But who are those heroes? Are they not true fighters, one and all? Tertullian fought a mighty battle against Marcion; Athanasius fought against the Arians; Augustine fought against Pelagius; and as for Luther, he fought a brave battle against kings and princes and popes for the liberty of the people of God. Luther was a great fighter; and we love him for it. So was Calvin; so were John Knox and all the rest. It is impossible to be a true soldier of Jesus Christ and not fight. God grant that you — students in the seminary — may be fighters, too! Probably you have your battles even now; you have to contend against sins gross or sins refined; you have to contend against the sin of slothfulness and inertia; you have, many of you, I know very well, a mighty battle on your hands against doubt and despair. Do not think it strange if you fall thus into divers temptations. The Christian life is a warfare after all. John Bunyan rightly set it forth under the allegory of a Holy War; and when he set it forth, in his greater book, under the figure of a pilgrimage, the pilgrimage, too, was full of battles. There are indeed, places of refreshment on the Christian way; the House Beautiful was provided by the King at the top of the Hill Difficulty, for the entertainment of pilgrims, and from the Delectable Mountains could sometimes be discerned the shining towers of the City of God. But just after the descent from the House Beautiful, there was the battle with Apollyon and the Valley of Humiliation, and later came the Valley of the Shadow of Death. No, the Christian faces a mighty conflict in this world. Pray God that in that conflict you may be true men; good soldiers of Jesus Christ, not willing to compromise with your great enemy, not easily cast down, and seeking ever the renewing of your strength in the Word and sacraments and prayer! You will have a battle, too, when you go forth as ministers into the church. The church is now in a period of deadly conflict. The redemptive religion known as Christianity is contending, in our own Presbyterian Church and in all the larger churches in the world, against a totally alien type of religion. As always, the enemy conceals his most dangerous assaults under pious phrases and half truths. The shibboleths of the adversary have sometimes a very deceptive sound. 'Let us propagate Christianity,' the adversary says, 'but let us not always be engaged in arguing in defence of it; let us make our preaching positive, and not negative; let us avoid controversy; let us hold to a Person and not to dogma; let us sink small doctrinal differences and seek the unity of the church of Christ; let us drop doctrinal accretions and interpret Christ for ourselves; let us look for our knowledge of Christ in our hearts; let us not impose Western creeds on the Eastern mind; let us be tolerant of opposing views.' Such are some of the shibboleths of that agnostic Modernism which is the deadliest enemy of the Christian religion today. They deceive some of God’s people some of the time; they are heard sometimes from the lips of good Christian people, who have not the slightest inkling of what they mean. But their true meaning, to thinking men, is becoming increasingly clear. Increasingly it is becoming necessary for a man to decide whether he is going to stand or not to stand for the Lord Jesus Christ as he is presented to us in the Word of God. If you decide to stand for Christ, you will not have an easy life in the ministry. Of course, you may try to evade the conflict. All men will speak well of you if, after preaching no matter how unpopular a gospel on Sunday, you will only vote against that gospel in the councils of the church the next day; you will graciously be permitted to believe in supernatural Christianity all you please if you will only act as though you did not believe in it, if you will only make common cause with its opponents. Such is the programme that will win the favour of the church. A man may believe what he pleases, provided he does not believe anything strongly enough to risk his life on it and fight for it. 'Tolerance' is the great word. Men even ask for tolerance when they look to God in prayer. But how can any Christian possibly pray such a prayer as that? What a terrible prayer it is, how full of disloyalty to the Lord Jesus Christ! There is a sense, of course, in which tolerance is a virtue. If by it you mean tolerance on the part of the state, the forbearance of majorities toward minorities, the resolute rejection of any measures of physical compulsion in propagating either what is true or what is false, then of course, the Christian ought to favour tolerance with all his might and main, and ought to lament the widespread growth of intolerance in America today. Or if you mean by tolerance forbearance toward personal attacks upon yourself, or courtesy and patience and fairness in dealing with all errors of whatever kind, then again tolerance is a virtue. But to pray for tolerance apart from such qualifications, in particular to pray for tolerance without careful definition of that of which you are to be tolerant, is just to pray for the breakdown of the Christian religion; for the Christian religion is intolerant to the core. There lies the whole offence of the Cross —a nd also the whole power of it. Always the gospel would have been received with favour by the world if it had been presented merely as one way of salvation; the offence came because it was presented as the only way, and because it made relentless war upon all other ways. God save us, then, from this 'tolerance' of which we hear so much: God deliver us from the sin of making common cause with those who deny or ignore the blessed gospel of Jesus Christ! God save us from the deadly guilt of consenting to the presence as our representatives in the church of those who lead Christ’s little ones astray; God make us, whatever else we are, just faithful messengers, who present, without fear or favour, not our word, but the Word of God. But if you are such messengers, you will have the opposition, not only of the world, but increasingly, I fear, of the church. I cannot tell you that your sacrifice will be light. No doubt it would be noble to care nothing whatever about the judgment of our fellow men. But to such nobility I confess that I for my part have not quite attained, and I cannot expect you to have attained to it. I confess that academic preferments, easy access to great libraries, the society of cultured people, and in general the thousand advantages that come from being regarded as respectable people in a respectable world — I confess that these things seem to me to be in themselves good and desirable things. Yet the servant of Jesus Christ, to an increasing extent, is being obliged to give them up. Certainly, in making that sacrifice we do not complain; for we have something with which all that we have lost is not worthy to be compared. Still, it can hardly be said that any unworthy motives of self-interest can lead us to adopt a course which brings us nothing but reproach. Where, then, shall we find a sufficient motive for such a course as that; where shall we find courage to stand against the whole current of the age; where shall we find courage for this fight of faith? I do not think that we shall obtain courage by any mere lust of conflict. In some battles that means may perhaps suffice. Soldiers in bayonet practice were sometimes, and for all I know still are, taught to give a shout when they thrust their bayonets at imaginary enemies; I heard them doing it even long after the armistice in France. That serves, I suppose, to overcome the natural inhibition of civilized man against sticking a knife into human bodies. It is thought to develop the proper spirit of conflict. Perhaps it may be necessary in some kinds of war. But it will hardly serve in this Christian conflict. In this conflict I do not think we can be good fighters simply by being resolved to fight. For this battle is a battle of love; and nothing ruins a man’s service in it so much as a spirit of hate. No, if we want to learn the secret of this warfare, we shall have to look deeper; and we can hardly do better than turn again to that great fighter, the Apostle Paul. What was the secret of his power in the mighty conflict; how did he learn to fight? The answer is paradoxical; but it is very simple. Paul was a great fighter because he was at peace. He who said, 'Fight the good fight of faith,' spoke also of 'the peace of God which passeth all understanding'; and in that peace the sinews of his war were found. He fought against the enemies that were without because he was at peace within; there was an inner sanctuary in his life that no enemy could disturb. There, my friends, is the great central truth. You cannot fight successfully with beasts, as Paul did at Ephesus; you cannot fight successfully against evil men, or against the devil and his spiritual powers of wickedness in high places, unless when you fight against those enemies there is One with whom you are at peace. But if you are at peace with that One, then you can care little what men may do. You can say with the apostles, 'We must obey God rather than men'; you can say with Luther, 'Here I stand, I cannot do otherwise, God help me. Amen'; you can say with Elisha, 'They that be with us are more than they that be with them'; you can say with Paul, 'It is God that justifieth, who is he that condemneth?' Without that peace of God in your hearts, you will strike little terror into the enemies of the gospel of Christ. You may amass mighty resources for the conflict; you may be great masters of ecclesiastical strategy; you may be very clever, and very zealous too; but I fear that it will be of little avail. There may be a tremendous din; but when the din is over, the Lord’s enemies will be in possession of the field. No, there is no other way to be a really good fighter. You cannot fight God’s battle against God’s enemies unless you are at peace with him. But how shall you be at peace with him? Many ways have been tried. How pathetic is the age-long effort of sinful man to become right with God; sacrifice, lacerations, almsgiving, morality, penance, confession! But alas, it is all of no avail. Still there is that same awful gulf. It may be temporarily concealed; spiritual exercises may conceal it for a time; penance or the confession of sin unto men may give a temporary and apparent relief. But the real trouble remains; the burden is still on the back; Mount Sinai is still ready to shoot forth flames; the soul is still not at peace with God. How then shall peace be obtained? My friends, it cannot be attained by anything in us. Oh, that that truth could be written in the hearts of every one of you! If it could be written in the hearts of every one of you, the main purpose of this seminary would be attained. Oh, that it could be written in letters of flame for all the world to read! Peace with God cannot be attained by any act or any mere experience of man; it cannot be attained by good works, neither can it be attained by confession of sin, neither can it be attained by any psychological results of an act of faith. We can never be at peace with God unless God first be at peace with us. But how can God be at peace with us? Can he be at peace with us by ignoring the guilt of sin? by descending from his throne? by throwing the universe into chaos? by making wrong to be the same as right? by making a dead letter of his holy law? 'The soul that sinneth it shall die,' by treating his eternal laws as though they were the changeable laws of man? Oh, what an abyss were the universe if that were done, what a mad anarchy, what a wild demon-riot! Where could there be peace if God were thus at war with himself; where could there be a foundation if God’s laws were not sure? Oh, no, my friends, peace cannot be attained for man by the great modern method of dragging God down to man’s level; peace cannot be attained by denying that right is right and wrong is wrong; peace can nowhere be attained if the awful justice of God stand not forever sure. How then can we sinners stand before that throne? How can there be peace for us in the presence of the justice of God? How can he be just and yet justify the ungodly? There is one answer to these questions. It is not our answer. Our wisdom could never have discovered it. It is God’s answer. It is found in the story of the Cross. We deserved eternal death because of sin; the eternal Son of God, because he loved us, and because he was sent by the Father who loved us too, died in our stead, for our sins, upon the Cross. That message is despised today; upon it the visible church as well as the world pours out the vials of its scorn, or else does it even less honour by paying it lip-service and then passing it by. Men dismiss it as a 'theory of the atonement,' and fall back upon the customary commonplaces about a principle of self-sacrifice, or the culmination of a universal law, or a revelation of the love of God, or the hallowing of suffering, or the similarity between Christ’s death and the death of soldiers who perished in the great war. In the presence of such blindness, our words often seem vain. We may tell men something of what we think about the Cross of Christ, but it is harder to tell them what we feel. We pour forth our tears of gratitude and love; we open to the multitude the depths of our souls; we celebrate a mystery so tender, so holy, that we might think it would soften even a heart of stone. But all to no purpose. The Cross remains foolishness to the world, men turn coldly away, and our preaching seems but vain. And then comes the wonder of wonders! The hour comes for some poor soul, even through the simplest and poorest preaching; the message is honoured, not the messenger; there comes a flash of light into the soul, and all is as clear as day. 'He loved me and gave himself for me,' says the sinner at last, as he contemplates the Saviour upon the Cross. The burden of sin falls from the back, and a soul enters into the peace of God. Have you yourselves that peace, my friends? If you have, you will not be deceived by the propaganda of any disloyal church. If you have the peace of God in your hearts, you will never shrink from controversy; you will never be afraid to contend earnestly for the faith. Talk of peace in the present deadly peril of the church, and you show, unless you be strangely ignorant of the conditions that exist, that you have little inkling of the true peace of God. Those who have been at the foot of the Cross will not be afraid to go forth under the banner of the Cross to a holy war of love. I know that it is hard to live on the heights of Christian experience. We have had flashes of the true meaning of the Cross of Christ; but then come long, dull days. What shall we do in those dull times? Shall we cease to witness for Christ; shall we make common cause, in those dull days, with those who would destroy the corporate witness of the church? Perhaps we may be tempted to do so. When there are such enemies in our own souls, we may be tempted to say, what time have we for the opponents without? Such reasoning is plausible. But all the same it is false. We are not saved by keeping ourselves constantly in the proper frame of mind, but we were saved by Christ once for all when we were born again by God’s Spirit and were enabled by him to put our trust in the Saviour. And the gospel message does not cease to be true because we for the moment have lost sight of the full glory of it. Sad will it be for those to whom we minister if we let our changing moods be determinative of the message that at any moment we proclaim, or if we let our changing moods determine the question whether we shall or shall not stand against the rampant forces of unbelief in the church. We ought to look, not within, but without, for the content of our witness-bearing; not to our changing feelings and experiences, but to the Bible as the Word of God. Then, and then only, shall we preach, not ourselves, but Christ Jesus the Lord. Where are you going to stand in the great battle which now rages in the church? Are you going to curry favour with the world by standing aloof; are you going to be 'conservative liberals' or 'liberal conservatives' or 'Christians who do not believe in controversy,' or anything else so self-contradictory and absurd? Are you going to be Christians, but not Christians overmuch? Are you going to stand coldly aloof when God’s people fight against ecclesiastical tyranny at home and abroad? Are you going to excuse yourselves by pointing out personal defects in those who contend for the faith today? Are you going to be disloyal to Christ in external testimony until you can make all well within your own soul? Be assured, you will never accomplish your purpose if you adopt such a programme as that. Witness bravely to the truth that you already understand, and more will be given you; but make common cause with those who deny or ignore the gospel of Christ, and the enemy will forever run riot in your life. There are many hopes that I cherish for you men, with whom I am united by such ties of affection. I hope that you may be gifted preachers; I hope that you may have happy lives; I hope that you may have adequate support for yourselves and for your families; I hope that you may have good churches. But I hope something for you far more than all that. I hope above all that, wherever you are and however your preaching may be received, you may be true witnesses for the Lord Jesus Christ; I hope that there may never be any doubt where you stand, but that always you may stand squarely for Jesus Christ, as he is offered to us, not in the experiences of men, but in the blessed written Word of God. I do not mean that the great issue of the day must be polemically presented in every sermon that you preach. No doubt that would be exceedingly unwise. You should always endeavour to build the people up by simple and positive instruction in the Word. But never will such simple and positive instruction in the Word have the full blessing of God, if, when the occasion does arise to take a stand, you shrink back. God hardly honours the ministry of those who in the hour of decision are ashamed of the gospel of Christ. But we are persuaded better things of you, my brethren. You have, indeed, your struggles here in the seminary: faith contends against doubt and doubt contends against faith for the possession of your souls. Many of you are called upon to pass through deep waters and to face fiery trials. Never is it an easy process to substitute for the unthinking faith of childhood the fire-tested convictions of full-grown men. But may God bring you through! May God bring you out from the mists of doubt and hesitation into the clear shining of the light of faith. You may not indeed at once attain full clearness; gloomy doubts may arise like angels of Satan to buffet you. But God grant that you may have sufficient clearness to stand at least for Jesus Christ. It will not be easy. Many have been swept from their moorings by the current of the age; a church grown worldly often tyrannizes over those who look for guidance to God’s Word alone. But this is not the first discouraging time in the history of the church; other times were just as dark, and yet always God has watched over his people, and the darkest hour has sometimes preceded the dawn. So even now God has not left himself without a witness. In many lands there are those who have faced the great issue of the day and have decided it aright, who have preserved true independence of mind in the presence of the world; in many lands there are groups of Christian people who in the face of ecclesiastical tyranny have not been afraid to stand for Jesus Christ. God grant that you may give comfort to them as you go forth from this seminary; God grant that you may rejoice their hearts by giving them your hand and your voice. To do so you will need courage. Far easier is it to curry favour with the world by abusing those whom the world abuses, by speaking against controversy, by taking a balcony view of the struggle in which God’s servants are engaged. But God save you from such a neutrality as that! It has a certain worldly appearance of urbanity and charity. But how cruel it is to burdened souls; how heartless it is to those little ones who are looking to the church for some clear message from God! God save you from being so heartless and so unloving and so cold! God grant, instead, that in all humility but also in all boldness, in reliance upon God, you may fight the good fight of faith. Peace is indeed yours, the peace of God which passeth all understanding. But that peace is given you, not that you may be onlookers or neutrals in love’s battle, but that you may be good soldiers of Jesus Christ. Origin: Banner of Truth. The above sermon was first published in The Presbyterian 99.13 (28 March 1929): 6-10. Notes added. The reference is to Charles Lindbergh, who completed the first solo non-stop flight across the Atlantic on May 21, 1927, less than two years prior to Machen's sermon. John Bunyan, The Pilgrim's Progress (Edinburgh: Banner of Truth, 1977). The Presbyterian Church in the United States of America (PCUSA). This sermon was preached just three months before Machen, with Allis, Van Til and Wilson, resigned from Princeton following the 1929 Assembly's decision to reorganise the Seminary. 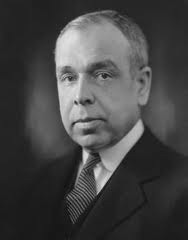 A few years later, Machen was to lead the group which broke away from the PCUSA to form what became the Orthodox Presbyterian Church (OPC).